Milky Way Bar, live and in color, 1924. Frank Mars introduced this one in 1923. It has been a hit ever since, although you can see that our current version has evolved a bit from these rustic beginnings. 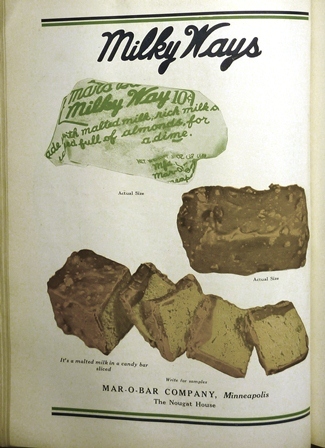 As you can see in the vintage image, the Milky Way was originally all about the nougat. And in the early days, the nougat was packed with sliced almonds–later, the almond, caramel and nougat would be reworked into a different candy bar. The caramel, which now shares top billing, was at first just a drizzle. And size mattered: note the repeated references in this ad to “actual size,” which was in fact massive, about 4 inches long and nearly 2 inches square, at a weight over 3 oz. Being mostly nougat, a lot of the volume was air. But even still, compared to current candy bar standard is closer to 1.5 ounces, Milky Way was a hefty morsel. The rustic look of the bar and package suggests that chocolate enrobing and candy bar wrapping are still in a pretty primitive state. This bar was wrapped by hand, as were most of the bars of the 1920s. In fact, the wrapping looks kind of sloppy. I’ve seen ads for candy bars from both larger companies and tiny outfits, and this style of wrapping was pretty common, whether some sort of paper as in this example or an imprinted foil. Wrapped candies of this sort had just begun to dominate the candy market, so expectations for what the wrapping should look like were not very settled. And since most of this was done by hand in factories, at high speeds, a certain slap-dash wrapping style is not so surprising. The promise of milk in a Milky Way was originally a reference to a soda fountain treat, malted milk. This ad promises that the bar contains “more malted milk by volume than is contained in a double malted milk at the soda fountain.” So instead of drinking your malted milk, you could eat it in the form of a candy bar. The focus on milk is to promote the “food value” of the candy bar. But the comparison here is between two different treat foods, both of which you would eat outside the home. This preserves the distinction between meal food and treat food, a distinction that seems to have broken down sometime later. These days, we assume “junky candy bar” is about as far as you can get from “wholesome glass of milk.” But if you follow this ad, it turns out Milky Way isn’t a candy bar at all! It’s “good food bar”! How can you resist the images of all the natural food products that go into the candy bar: corn, eggs, milk from a gentle cow. The logic goes like this: candy comes from food, so candy IS food. And where in this ad is the Milky Way? If you take away the voice-over and just look at the moving picture, you might conclude that this is a promotion for American family farms and fresh, local produce. Unlike most candy ads, there are no images at all of the actual candy bar until the final tag, which shows the candy safe in its wrapper. So what ever is in that wrapper, one thing we know is that it came from the farm. It’s a fantastic idea: candy that grows on the farm. Slapping a picture of a barn or an ear of corn on the package of some highly processed food product is a pretty familiar ploy. We talk a lot about “real food” these days. The wish for “real food” isn’t new, though. This Milky Way ad suggests that even in the 1960s, an era that enthusiastically embraced all the wonders of food science, consumers hoped that inside the wrapper the food would still be wholesome and have some relation to things that grow. And advertisers, then and now, bank on consumers not being able to tell the difference between a pretty picture and the truth. We think of candy as being all sugar. That’s what is so bad about candy, I’ve heard. In 1926, an Ohio candy manufacturer put together this display after his customers complained too much about the price of his goods. Sugar prices were falling, but those candy makers still expected to be paid! The point of this display is to show the various and expensive ingredients that a candy maker uses. 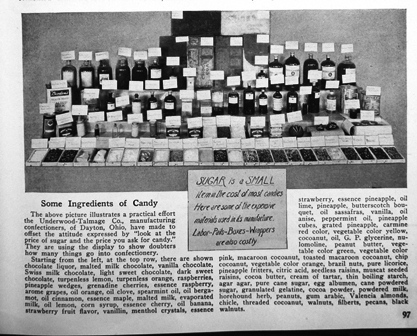 Some variation of this “many ingredients of candy” was also a popular defense when candy makers sought to prove that candy was food: the milk, eggs, butter, nuts and fruit gave evidence that candy was made of the same wholesome ingredients as every other kind of food. Chocolate liquor, malted milk chocolate, vanilla chocolate, Swiss milk chocolate, light sweet chocolate, dark sweet chocolate, turpenless lemon, turpenless orange, raspberries, pineapple wedges, grenadine cherries, essence raspberry, arome grapes, oil orange, oil clove, spearmint oil, oil bergamot, oil cinnamon, essence maple, malted milk, evaporated milk, oil lemon, corn syrup, essence cherry, oil banana, strawberry fruit flavor, vanillin, menthol crystals, essence strawberry, essence pineapple, oil lime, pineapple, butterscotch bouquet, oil sassafras, vanilla, oil anise, peppermint oil, pineapple cubes, grated pineapple, carmine red color, vegetable color yellow, cocoanut, oil, G. P. glycerine, nucomoline, peanut butter, vegetable color green, vegetable color pink, macaroon cocoanut, toasted macaroon cocoanut, chip cocoanut, vegetable color orange, brazil nuts, pure licorice, pineapple fritters, citric acid, seedless raisins, muscat seeded raisins, cocoa butter, cream of tartar, thin boiling starch, agar agar, pure cane sugar, egg albumen, cane powdered sugar, granulated gelatin, cocoa powder, powdered milk, horehound herb, peanuts, gum Arabic, Valencia almonds, chicle, threaded cocoanut, walnuts, filberts, pecans, black walnuts. Halloween is over. Now all is quiet in candy land. I think about candy all year long. It’s my job. One of the big questions that I’m always working on is: what is the relation between candy and food (see, for example, Defining Candy: the Candy Tax)? I’ve noticed that in the world of food journalism, there is a very simple answer. Candy is not food if it is any month other than October. Then suddenly, in October, as Halloween approaches, every food magazine, blog, web site, and newspaper section runs something about candy. I’m being a little facetious, of course. But it is striking how absent candy usually is from “serious” discussions about food. After all, we do eat it. It’s not like Halloween has a lock on candy. There is the candy debauch of trick-or-treat, of course, and huge quantities of candy sold and bought. But Halloween candy sales, as significant as they are, are nevertheless a fraction of total candy industry revenues. Although there is special packaging for Halloween, most of the varieties of candy sold are the same candies we eat the rest of the year. So why can we only talk about candy at Halloween? Here’s my theory: on Halloween, food and candy trade places. Historians have noted that festivals like Halloween serve an important social function, like a pressure valve. On Halloween, all kinds of normal relationships are reversed. Kids who normally have to sit still and keep quiet get to take over the streets. Costumes let you dress up like the president or a monster. In the old days, communities tolerated pranks and mischief. Like Carnival or New Years, Halloween is a day to blow off a little steam, to misbehave, to defy authority or break the rules without suffering the consequences. The absence of candy from the food discussion keeps our categories clear: candy isn’t really food. And then once a year, we reverse the place of candy and food, and candy takes center stage. But it’s only for Halloween. So we get the fun and release of candy craziness for a month. Then candy is once again exiled to the not-food fringe, where we don’t have to think about it too much for another year. Here at Candy Professor, we believe that if everybody else thinks it’s not important, it probably is. Shove candy off-stage for eleven months a year, and then gorge on it the twelfth. Something is going on there. Eleven months of food. One month of candy. So the “food” of those eleven months, it’s not candy. Right? Or is it just the fact that it is “not candy” that makes it look like it’s not candy? Why are candy and food so opposite? Or are they? Well, that is the question of the day, candy friends. Best quote of the article: “Saying we need to add sugar and flavoring to milk to get kids to drink it is like saying we need to feed kids apple pie if they don’t like apples.” Ann Cooper (she runs the Boulder CO school lunch program, one of the districts that is going back to school chocolate milk free). The key to the whole fight comes down, as all else surrounding food, to money: the schools only get federal lunch funds if your school lunch offering includes a grain, a vegetable, a fruit and a protein. And milk. And you only get the funds if kids take three of these five offerings. So chocolate milk, being a popular choice with the kiddies, knocks out one of the three mandatory picks. Given that the easy chocolate milk provides more leeway for kids to pass on mystery meat and gray “green” beans, schools are crying foul at attempts to insist that milk is milk, and chocolate milk is something else entirely. Have you raised your hand for chocolate milk? Or have you raised your finger? Really? Would it be so bad if kids drank less chocolate milk? Yeah, I get that it’s made out of milk. But is it really food? Interestingly, the National Confectioners Association was what brought the chocolate milk promotion to my attention. You know, the candy industry. Once we can discern the difference between food and “food-like substances,” our diet returns to something healthful and sustaining and simple. And if we are mostly eating food, then there is no harm in eating some candy. So long as we’re clear, that candy is not food, not a substitute for food, and not to replace or displace food. Candy is defensible as part of our diet only when we draw a sharp line between food, what we enjoy as we nourish our bodies, and candy, something we eat purely for pleasure. Which brings me to chocolate milk. Is it food? or is it candy? Although nobody says it this way exactly, this question is really at the crux of this latest flare up. In fact, this is just the latest salvo in a long-standing fight over the role of candy in school lunches. This was one the candy industry was probably fated to lose, but believe it or not, there was a time when candy was on the “approved” list. Clearly, if the fight now is about chocolate milk rather than chocolate bars, times have changed. But the terms of the fight have stayed eerily constant. Chocolate milk is an odd hybrid, with an interesting history of its own. In the nineteenth century, there really was no “chocolate milk” as we know it today. Chocolate in sweetened milk was for sick people, old people, people who couldn’t stomach much else. Chocolate was viewed as providing sustenance and strength to the weak and infirm, a sort of tonic with vaguely healthful properties. Chocolate milk in the twentieth century came to be increasingly associated with childhood. Prior to the “chocolate milk revolution” in the 1950s, cold chocolate milk was not really feasible. Hot chocolate was the childhood equivalent of hot coffee, a combination of sweetness and milkiness that seemed essentially infantile. But hot chocolate required heating milk (a delicate operation) and measuring and mixing at the stove. Not difficult, but not something kids would do alone. Instant chocolate milk mix changed the playing field: Nestle, Carnation, Ovaltine were all introduced in the early 1950s, a time when food engineering introduced the TV dinner and other “convenience” monstrosities to the American table. Now children could enjoy delicious chocolate milk any time, with no mess and no trouble. Ads for these products feature cherubic children and pudgy hands mixing and drinking dark brown elixirs. Chocolate milk was a big part of twentieth century childhood, to be sure. But chocolate milk at home as a snack or a treat in the context of all the other foods that mother has chosen is one thing. And for the most part, those 1950s kids were skinny and didn’t know a thing about diabetes or pediatric heart disease. For most U.S. kids in the twenty first century, chocolate milk every day on the school lunch line is something else. For kids with serious food and health issues, the line between food and candy needs to be drawn, and it needs to be crystal clear. And we all need to acknowledge: chocolate milk is candy. That is to say, chocolate milk should be enjoyed as a treat, occasionally, not as a daily beverage. They say kids won’t drink milk unless its flavored. They say at least chocolate milk has the nutrients of milk. They say it’s better than soda. By this logic, I should have a screwdriver with my oatmeal every morning. Because otherwise, I just won’t drink that orange juice. Teach kids to drink soda, they drink soda. Teach them soda is a bad choice, give them water, they’ll drink water. Chocolate milk is no different. Pandering to the lowest denominator, the sweet tooth, and insisting that children will do no better if given the chance is just patronizing. The school lunch programs are making huge improvements. In the New York City schools, they are eating the whole grain breads, they are learning about fresh fruits and vegetables. Alice Waters has her kids eating okra and kale, for pete’s sake. Will kids drink less milk when it’s not sweet chocolate? Some. But that’s because they had the chocolate to start with. We need a little re-education here. There is no reason they can’t learn to appreciate the difference between real food and nutritionally tarted-up candy. Candy has been discovered by home economists to be an all-day food. From candy-coated cereals for breakfast to a midnight nibble, there is no moment of the day when candy can’t be used to fit into pleasant times. And what does that enjoyment look like? Candy for dessert is a no-brainer. How about the candy-and-fruit tray? or the “Scout soda,” that would be an orange with a candy stick stuck in for sipping. Another suggestion is “Strawberries Pastel”: lovely fresh strawberries surrounding a mound of pulverized after-dinner mints. Dip you strawberry in the mint–Delicious! But don’t think candy can’t come to your aid through the rest of the meal. Meat and vegetable sauces? You bet. Try candy mints to flavor your lamb sauce. Crushed peanut brittle in your cole slaw. Candy sauce for carrots. And although it goes unmentioned in “Candy in the Home,” I’m sure there’s something you can do with those cinnamon red hots. All of these seem a little surprising to today’s palette. On the other hand, many of the “novel” uses for candy suggested in this chapter are by now so ordinary that we barely recognize them. Cakes and cookies, especially those made for children, are frequently decorated with colorful candies like gum drops, jelly beans, or M&Ms. Hard to believe it, but there was a time when no one would have thought to mix candy and cake. Adding chopped chocolate, chocolate chips, or even chopped candy to any kind of cake or cookie seems today pretty obvious. Back then, the author found need of extensive explanation and justification for this “dressing up.” Candy as a topping for ice cream was once a big surprise; today, it’s hard to find ice cream that doesn’t have candy mixed in. Source: “Candy in the Home,” chapter 8 of All About Candy and Chocolate by Philip Gott (NCA, 1958).